Forming in 2010, the West London quartet quickly rose to the attention of critics and listeners seemingly out of nowhere even selling out their first ever London show with members of Franz Ferdinand, Mumford & Sons, and The Maccabees in attendance. The band then embarked on tours throughout Europe, the UK and the U.S. supporting the likes of Arctic Monkeys, Red Hot Chili Peppers, The Stone Roses, and Arcade Fire. Equally influenced by The Ramones as it was The Beach Boys their debut album, ‘What Did You Expect From The Vaccines?, was released in March 2011 and was subsequently included in many “Album of the Year” lists. Given that their debut album was heavily stylized and all they’d achieved in such a short amount of time, what could they do next? At the end of May 2012 The Vaccines announced details of a second album and the first single surfaced called “No Hope”. While still continuing with the punk-rock influence of their debut, “No Hope” also showcased new influences. A four-track single / EP for the song was officially released on July 9 (read review) while a more familiar sounding second single and video followed soon after in the form of “Teenage Icon”. ‘Come of Age’ opens with the first single “No Hope” and what initially sounds like “Brianstorm” by Arctic Monkeys. The band drops out soon after leaving just a guitar and vocal and it’s immediately apparent somebody’s been listening to Bob Dylan, going so far to adopt Dylan’s trademark drawl. It’s all a little touch and go at first but once the chorus arrives there’s no looking back and “No Hope” has all the ingredients of a sure-fire indie-rock anthem. Listen for the “call-and-response” during the bridge and Justin Young’s Johnny Rotten-like snarl when he sings “I am so self obsessed”, showing that the band’s punk-rock edge is still very much in tact. “No Hope” also contains the album title in its lyrics and sets the theme of the record documenting the struggles when coming of age. “I Always Knew” comes next and immediately takes the tempo down a notch. Young sings over 50’s guitar melodies in a lower than usual vocal range before returning to full voice during song’s “doo-wop” tinged chorus. The second single “Teenage Icon” follows and sees the band return to the more familiar template and at only 3 minutes and 5 seconds in duration it doesn’t mess about with the chorus arriving after just 32 seconds. Immensely fun, “Teenage Icon” is another slice of perfectly written pop. However, it’s at this point that the album takes a surprise turn. Without any hints of the band’s trademark punk-edge or indie-rock, “All In Vain” is a masterclass in authentically 50’s era songwriting. “Ghost Town”, “Aftershave Ocean”, and ‘Weirdo” all too introduce not only new influences but a whole new side to The Vaccines. Justin Young too demonstrates many more characteristics to his voice this time around – just check out “I Wish I Was a Girl”, which you’d be hard-pressed to even pick as The Vaccines. Closing number “Lonely World” is a weighty ballad that Buddy Holly would be proud to call his own. On ‘Come of Age’, The Vaccines don’t so much as take a step forward but a giant leap. Its immediately clear how much more diverse and complex it is than their debut. With the exception of “Teenage Icon” and “Bad Mood”, gone are the 2-3 minute punk-rock numbers as is any gimmick or shtick that may have been shown on their debut. 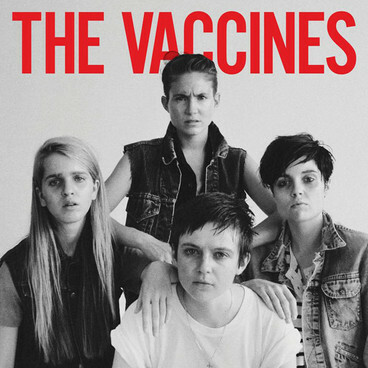 Instead ‘Come of Age’ showcases The Vaccines as legitimate and complex songwriters and indeed coming of age. Although the record isn’t as immediate or as “fun” as their debut, multiple spins reveal there are many rewards for the taking but they take excavating, which is not something we’ve come to expect from The Vaccines. ‘Come of Age; was released in the UK on 3 September and in the U.S. on 2 October. Tags : Arctic Monkeys, Bob Dylan, Buddy Holly, Come of Age, Come of age review, Indie reviews, indie-rock, Johnny Rotten, No Hope review, punk-rock, surf-rock, Teenage Icon, The Ramones, The Vaccines, What Did You Expect From The Vaccines?